Puzzles come in all sizes and complexities. A Chanukah gift for our girls, a puzzle of 1000 pieces, turned into a month-long family project. There are some intuitive strategies for assembling puzzles all of which start with the recommendation to complete the outside border of the puzzle first. What amazed me during my participation was how many times I was “convinced” that there were pieces missing (I even thought that pieces of the border were missing). When the last pieces were being placed in by 4 year-old Isabel I relived those moments of disbelief and learned a humbling lesson (yet again): what was missing was not on the outside, what was missing was on the inside—my inability to see how the connections worked to form the parts and the whole of the puzzle. Puzzles come in all sizes and complexities. A core Kabbalah teaching is that we are all parts of each other’s puzzle—that even if we don’t directly “touch” we are essential parts of an interconnected whole. This puzzle is not two or even three dimensional—it has dimensions that stretch beyond space and time and is constantly shifting and evolving as pieces transform through connecting. Visiting with friends or family can bring clarity or mystify even more the contours of the puzzle of who you are in each other’s lives. Have you ever had a conversation with someone about a past event and they have a recollection of it that is not the way you remember it (at all)? I witnessed this the other day when a friend told a story about me that confirmed for them a way of seeing me more favorably than I recalled was the case. 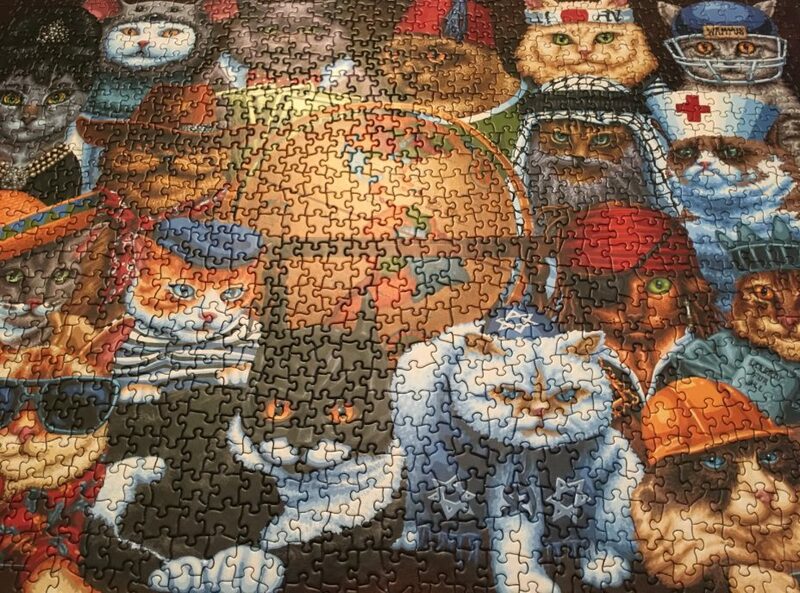 There were times putting the 1000 piece puzzle together that pieces seemed to fit, but they weren’t a perfect fit—and that meant taking them apart. With people, sometimes the smoothing over of memory allows for a better fit, a way for transformation to occur that round sharp edges in a relationship. Puzzles come in all sizes and complexities. Try putting a puzzle together. See what confronts you? See what you can extrapolate from that process to the puzzle of your own life? See what lessons you learn about the interconnectedness of relationships which form the largest puzzle of all: the puzzle of existence. It is a complex puzzle not because of the infinite number of pieces. Its complexity lies in the infinite nature of the pieces as they connect to be a part of a much larger puzzle. Watching other people piece together jigsaw puzzles would not sound like the most inherently cinematic pursuit, nor would it seem to provide much opportunity for character development. Puzzles are a solitary activity—a chance to focus quietly and inwardly, to retreat from the peripheral noise of the outside world. All of which makes “Puzzle” such a lovely surprise. A million tiny revelations make up one massive arc, and Kelly Macdonald positively radiates hope and joy throughout that process. The directorial debut from producer Marc Turtletaub (“Little Miss Sunshine,” “Loving”) gives Macdonald a rare and welcome starring role in which to shine—albeit in an understated and unassuming way, at first. Watching her blossom throughout the course of the film in such an unexpected way is a true pleasure. And while “Puzzle” adheres to a bit of a formula in depicting her character’s path of self-discovery, it’s filled with vivid details and lovely grace notes along the way.